If you follow this website, you know I’m a Paul Auster fan and will read anything he publishes. I love the man’s fiction just as much as his nonfiction, and I’ve learned more about the craft of writing through his personal tales than I thought possible. Report from the Interior is about his coming of age through his very own eyes. He recounts his thoughts and feelings on a great number of subjects from the time he was a little boy all the way into adulthood. Somehow, he makes almost all of it riveting, even as he’s describing movies he watched that heavily influenced him. I attribute the dynamism of rather mundane topics to his unparalleled mastery of the captivating sentence. The man simply knows how to write in a way that cannot be ignored, no matter what the topic! 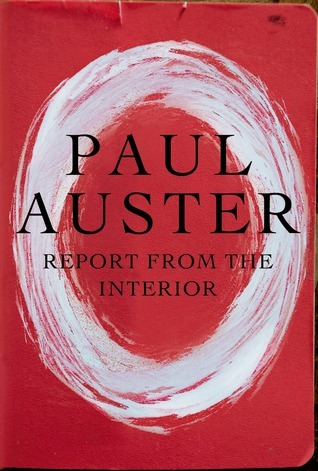 Report from the Interior serves almost as a history lesson, for Auster not only recollects the little personal things he experienced, but also the world’s happenings and his reactions to them. I loved viewing these events through his eyes, with his voice serving as a guide. And though I’m an unabashed fan of the man, I cannot suppress some criticism. The book is divided into four parts. It’s the third part that, frankly, I had difficulty reading. It is largely comprised of notes he wrote to a loved one during his late teens and early twenties. They are pretentious, arrogant, and self-obsessed. And while I know all of us are those things at that age, it was very challenging to stomach. I do, however, admire Auster that he was brave enough to put those letters out there, to display an aspect of himself that I didn’t find terribly flattering. The man continually takes risks, even as an established master, and he has my unending readership as a result. In the end, Auster continues to give himself to us, to peel away layers of his persona that contribute to the writing we so love. The most amazing thing is, and this is yet another credit to the man’s skill, that the more he reveals to us, the greater of an enigma he becomes. To the uninitiated, I’m not sure this book is a good place to start with Auster. But for those who have read much of his work, it’s yet another volume that adds to the overarching epic that is, in my mind, one continuous story blending fiction with nonfiction, novel with memoir, poetry with correspondence. This entry was posted in Book Reviews and tagged Book Review, fiction, literature, Paul Auster, report from the interior, review.